Artillery forts were strong enough to take cannon fire, large enough to hold a garrison of soldiers (and perhaps also encompass a town), and each one spread out far beyond what any medieval castle would require for ground. But as suggested in the computer simulation above, in profile and from a distance those forts were not awe-inspiring nor even stirring to the eye. As anyone outside standing in a field would see it, a fort tended to resemble the back side of a dike. The first impression for a modern person would be "oh, a railroad embankment." 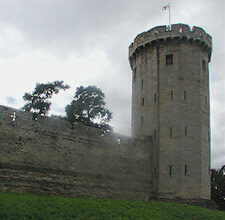 With its daring vertical walls and high towers, a medieval fortification gripped the heart. An artillery fort did not inspire with its sloped sides on a low and broad shape. Only when one came close did an artillery fort command respect. This brings us to the next chapter: Beyond the Basics. Artillery fortresses that went up across Europe were either all earth or an earth core faced and reinforced with masonry. Masonry made a sturdy, weather resistant, but costly enhancement.